Are you considering a professional relationship, as either an investor or partner? Learn everything you can about the business in question. Learn about the people involved. We compile a valuable profile of any U.S. company, partnership or corporation, it's creditworthiness and standing in the local, state, and national communities. We confirm your input and give an account of all we learn. You do not need to know the names of the company owners as we will identify the owners with the included Business Credit Report and conduct a thorough background check on each, which includes four levels of criminal searches, civil search for lawsuits and legal actions, plus derogatory credit history entries, like liens, bankruptcies, and judgments. This search includes an all-important Credit Report. We also tap all 50 Secretary of State's databases, and we access professional licenses, tax liens, UCC, & legal action databases. We often identify bank and financial accounts. UCC filings searches often return the name of the bank or lending institution that provided the financing for corporate loans. Our Business Credit Report many times returns bank relations. We tap huge national databases for company and personal assets information. We confirm professional licenses. Our court representatives search county records for tax liens, judgments, and complaints. 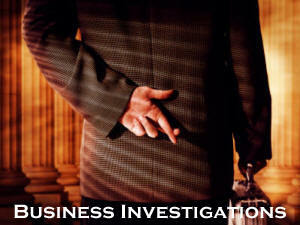 Investigative Professionals' Reports are often returned within hours and are 100% guaranteed and confidential. Free consultation by phone and by email.